Add Hypnotherapy to your credentials and qualifications! Whether you are a hypnotherapist who wants to take your competence to higher level or you are a medical, mental health, or coaching professional who wants to expand your practice, our ACCH certification program is designed to do just that. Why complete the ANNH program and add ACCH to your credentials? Enhance your existing medical, mental health, or couching skills by mastering the art of suggestion, the use of imagination, and helping your clients and patients change their space and time perceptions. If have previously completed a hypnotherapy certification program, upgrade your skills by completing the ANNH program. Most hypnotherapy education programs focus on a very narrow set of skills which tend to work only in ideal situations. Not only does ANNH cover the full spectrum of classical and permissive techniques, it helps our participants understand and master several Neurology of Suggestion, space/time-based perceptual interventions, and even energy-based approaches. These include many techniques that are based upon several scientifically-validated concepts that have only recently been validated. Our certification program is through The International Hypnosis Research Institute. This is the most advanced hypnosis certification available today. The theory is based upon sound scientific evidence. However, the techniques are surprisingly simple and easy to master. This certification program includes 12 online courses with a total of 84 lessons. You can even take courses for free by joining The International Hypnosis Research Institute. Advanced Neuro-Noetic Hypnosis™ is the most effective personal change technology presently available. Rather than merely using the age-old, traditional hypnosis techniques of relaxation, guided imagery, and suggestions, we use a very enjoyable variation to rapidly re-shift imbalances of energy concentrations in the mind, brain, and body. Although our sessions appear very similar to older hypnotic techniques, they are actually quite different. In a shorter time, people experiencing this new technology will feel better, and move toward an "improved version" of themselves faster then they ever thought possible. The mind/brain and the body are organized around concentrations of energy. Energy concentrations in the mind/brain and body are organized in patterns. 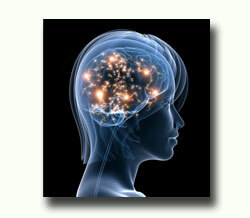 Patterns of energy concentrations in the mind/brain and body represent states of health and functioning. Through the use of will (as exerted in the frontal lobe) humans, have the ability to restructure energy patterns. By using thought to restructure energy patterns, individuals (and communities) can cease dysfunctionality and promote inner peace, health and happiness. 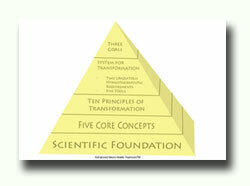 Click on pyramid above to for a brief introduction. ©1992- 2019, The International Hypnosis Research Institute, All rights reserved.